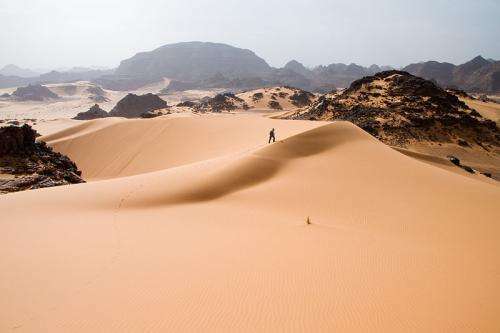 New research investigating the transition of the Sahara from a lush, green landscape 10,000 years ago to the arid conditions found today, suggests that humans may have played an active role in its desertification. The desertification of the Sahara has long been a target for scientists trying to understand climate and ecological tipping points. A new paper published in Frontiers in Earth Science by archeologist Dr. David Wright, from Seoul National University, challenges the conclusions of most studies done to date that point to changes in the Earth's orbit or natural changes in vegetation as the major driving forces. "In East Asia there are long established theories of how Neolithic populations changed the landscape so profoundly that monsoons stopped penetrating so far inland," explains Wright, also noting in his paper that evidence of human-driven ecological and climatic change has been documented in Europe, North America and New Zealand. Wright believed that similar scenarios could also apply to the Sahara. To test his hypothesis, Wright reviewed archaeological evidence documenting the first appearances of pastoralism across the Saharan region, and compared this with records showing the spread of scrub vegetation, an indicator of an ecological shift towards desert-like conditions. The findings confirmed his thoughts; beginning approximately 8,000 years ago in the regions surrounding the Nile River, pastoral communities began to appear and spread westward, in each case at the same time as an increase in scrub vegetation. Growing agricultural addiction had a severe effect on the region's ecology. As more vegetation was removed by the introduction of livestock, it increased the albedo (the amount of sunlight that reflects off the earth's surface) of the land, which in turn influenced atmospheric conditions sufficiently to reduce monsoon rainfall. The weakening monsoons caused further desertification and vegetation loss, promoting a feedback loop which eventually spread over the entirety of the modern Sahara. There is much work still to do to fill in the gaps, but Wright believes that a wealth of information lies hidden beneath the surface: "There were lakes everywhere in the Sahara at this time, and they will have the records of the changing vegetation. We need to drill down into these former lake beds to get the vegetation records, look at the archaeology, and see what people were doing there. It is very difficult to model the effect of vegetation on climate systems. It is our job as archaeologists and ecologists to go out and get the data, to help to make more sophisticated models." Despite taking place several thousands of years ago, the implications of humans being responsible for environmental and climatic degradation are easy to see. With approximately 15% of the world's population living in desert regions, Wright stresses the importance of his findings: "the implications for how we change ecological systems have a direct impact on whether humans will be able to survive indefinitely in arid environments." 6,000 years ago, the Sahara desert was tropical—what happened? The article fails to mention the Sahara Desert was a desert 10,000 years ago. It was "tropical" for only a short period of time before it turned back into a desert. We should ask why it turned green for such a short period of time instead of why it reverted back to the desert it had been for thousands of years. There are significant anomalies that plague the textbook theories for these large deserts. The sheer volume of sand which suddenly appeared in what seems to be a large "sand scar" across Africa and the Middle East are staggering. To suggest that humans caused this does not even come close to addressing the theoretical problems. The textbook theory for the origin of the large sand and sandstone deposits towards the West Coast of the United States relies upon a fictitious river which is claimed to have transported the sand from the Appalachians. Worst theory ever. Microscopy of colored sand grains reveals a perplexing situation: Quartz is of course clear, so why is sand so commonly colored? Turns out that those grains have a thin veneer of iron oxide coating the clear quartz. How can this be? Iron is not involved in the process for forming sand. When researchers pursue their narrative, they do so at the expense of solving the actual riddles. Ah, what the heck! Let's go for the trifecta of crackpottery. Here's my hypothesis. A combination of geophysical location plus irregular global climate events plus changes in local weather patterns. Upon which are thousands of generations of human activities. With really mediocre weaponry and tools, humans utilized fire. A whole lot more then realized. Whether burning grasslands or burning forests. The use of fire went on year after year, generation after generation. Since a hell of a long time ago. Occurring on a regular basis, even in regions of tropical monsoons. Add in selection of edible plants and protecting grazing animals. Over millennia, that added up to expand today's deserts. Quartz is of course clear, so why is sand so commonly colored? Turns out that those grains have a thin veneer of iron oxide coating the clear quartz. How can this be? Iron is not involved in the process for forming sand. Back when you were trying to source all of our sand to Mars, https://phys.org/...ved.html , you also mentioned "Sand's color comes from a thin varnish of iron-oxide glued to the quartz with clay." I pointed out that iron oxide and clay are reaction products of basalt and other volcanic materials with water, so all that is needed to glue iron oxide to sand is a nearby volcano and some rain. Riddle solved. Your "response" was to abandon the thread. With a major solar outburst, it will be possible for the iron ions to reach Earths surface. An electric field capable of breaking bonds will remove the silica grains from the surface and introduce the iron coating. Sand is not produced by aeolian forces, on this planet or any other. Re: "I pointed out that iron oxide and clay are reaction products of basalt and other volcanic materials with water, so all that is needed to glue iron oxide to sand is a nearby volcano and some rain. Riddle solved." And how again does the varnish coat the outside of each individual grain w/ your process? Why is your preferred explanation not already the go-to answer? We don't need to guess. There was an instance in the not-too-distant past where hot grains of sand were observed falling from the sky like rain. "A rain of dust was reported in some places, hot sand or gravel in other places." We today call it the Great Chicago Fire, and hundreds of similar fires started at the same time in Wisconsin, Michigan and Illinois. The coating of individual grains requires a non-abrasive transport akin to what happens to rain droplets. Quartz is rarely pure, it usually contains transition element impurities. In bulk, quartz has low surface area, but as you finely grind it into sand, this greatly increases surface area which is then oxidised under atmospheric conditions. Iron is the most abundant of transition elements, so oxidised quartz sand will take its hue mostly from iron oxides. As for source of sand, wind alone cannot create sand, but rivers can, and so can wind carrying already formed sand. Especially if you have sandstone bedrock resulting from earlier sediments of rivers that have long changed their course due to tectonic processes. This article begs the question, what other large expanses have been created artificially? Jared diamond in 'Guns Germs and Steel' relates that early settlers found ready-made fields in eastern north america and buffalo grazing in new jersey. Amerinds regularly slashed and burned for crops and wildlife. So how were the great plains created? Are they totally natural, enhanced, or wholly artificial? I suppose cosmic electricians will tell us that huge sparky vortices sucked up all the trees, leaving bison and antelope uncooked and free to roam. How fortunate for the Arapaho. The ice age finished before 10.000 years ago - how the people could initiate the climatic change in the past? Of course we did, don't they know people exhale CO2 when they breathe? AGW is an indisputable FACT!!! All people need to die to save our world from ourselves. The Sahara like other deserts sit at the right latitude for desertification, 20-30deg north and south of the equator. Continental effects can magnify the degree of aridity. Nothing new there, but the important observation is that they sit at a tipping point, small variations in an already unstable local climate can push the equilibria to expand or contract the area of desert. A poster child for why you don't willingly stuff around with a system that is at favourable equillibrium for life. I especially like the part where you talked about the article and didn't mindlessly harp on whatever bugaboo drives you. Quartz from volcanic sources doesn't need some esoteric electric field to include metal oxides or ions, amethyst's colour comes from manganese; rose quartz has varying amounts of titanium, iron and manganese. Quartz can be amorphous and behave like a glass trapping inclusions of oxides and other minerals. Granite like rocks get eroded and the softer minerals just turn to powder or soluble salts, the silica grains being tough and insoluble settle out to become sand. 'Pure' silica deposits need grasses or dinoflagelates, both utilise a pure silica structure which settles out under favourable conditions to form a hydrated gel which is opal or rarely, pure silica. Rather than get into a pi#$ng contest at each other, why not read and observe. Observe that red soil seems a given at least in part in every rocky body in our Sol system possessing an atmosphere! Even here! Soil in 'Nam was red, a lot of it, and we have red soil in a large part of our west, and I well remember as a high schooler in western North Carolina having the red soil, mud, whatever all over my pants, socks, shoes every day and double nasty on phys ed class days. That red clay defined us southerners of more than just the Carolinas. Brazil has it too. Venus under the atmosphere is red hot an red all over. So is Mars. Same difference for Europa. Culprit is iron and its oxides. Ferric AND ferrous oxides are red and it is a sizeable portion of our planetary composition. Some say the sun went nova once. Stars that blow up do so because iron fusion is endothermic, causing stellar collapses leading to novas. If so, we need to go to space if we humans wann survive! As a child of 4, I remember reading in the Cleveland Plain Dealer that the Sahara was created by sheep herders overgrazing their lands, starting about 6,000 years ago. This gradually led to desertiification that incrementally and then progressively made the place uninhabitable. Eventually the descendant survivors of their own calamity settled at the fringes where there was no longer enough area to pastoralize, and had to do agriculture of the planting veggies kind in order to survive. This farming began on the north coasts and the Nile Valleys. Admittedly a simplistic view...herders forced to eat their animals while migrating to a last stand along the Nile. Bet there is a LOT of real archaeology under the sand, and satellites will find by remote sensing the true history about which we know nothing. Maybe cities and cultures unknown to us; maybe even alien influence? Who knows? "New research from The University of Texas at Austin reveals that the Earth's unique iron composition isn't linked to the formation of the planet's core, calling into question a prevailing theory about the events that shaped our planet during its earliest years. The research, published in Nature Communications on Feb. 20, opens the door for other competing theories about why the Earth, relative to other planets, has higher levels of heavy iron isotopes. Among them: light iron isotopes may have been vaporized into space by a large impact with another planet that formed the moon ..."
"Startling evidence has been found which shows mammoth and other great beasts from the last ice age were blasted with material that came from space. Eight tusks dating to some 35,000 years ago all show signs of having being peppered with meteorite fragments." "... The analysis showed that the island mammoth had accumulated multiple harmful mutations in its genome, which interfered with gene functions ..."
"But in addition to being cut off from the rest of the continent, the water that feeds Blood Falls is completely cut off from the atmosphere -- it has never seen sunlight and is completely devoid of oxygen. It's also extremely rich in iron, which was churned into the water by glaciers scraping the bedrock below the lake." So many peculiar observations of iron! "Valles Marineris is four times deeper than the Grand Canyon, and stretches for almost 3,000 miles across the face of mars. Its presence has continued to baffle scientists. When the Mariner probes returned the first pictures of this continental-scale trench, many proposed catastrophic flooding as its cause. But scrutiny of later images revealed no outwash or debris field left by erosion, and no sign of ponding. Nor did the short 'tributaries', ending in cleanly cut alcoves, fit any reasonable profile of a drainage system. Later probes revealed the signature of olivine in deep strata of the chasm. Since olivine readily reacts with water, its presence clearly excluded water erosion. What force, then, could have removed 2 mil cubic km's from the Marian surface? Geologists began to speculate about 'unknown' causes of surface spreading and 'mass-wasting' on a scale never before imagined." (3) The sudden appearance of sand in areas which were not too long ago fertile (we know because we oftentimes find human civilizations beneath them). There seems to be more than enough reason here to suspect that deserts have nothing at all to do with humans, and that the sand could have come from space. "Eight tusks dating to some 35,000 years ago all show signs of having being peppered with meteorite fragments." Not possible for tiny iron particles to travel through the atmosphere with the velocity required to embed themselves in the ivory. That is why I favour 'hungry' multiply ionised iron ions seeking some easy electrons. yes, lets, starting with why you need multiple socks to post? credibility issues? can't find science? This one may be quite out there but what about massive glacial deposits of sand? I'm gonna be like a typical astrophysicist, the aliens did it! Let's see; 10,000 years ago the Sahara was a tropical paradise while North America and Europe were in an ice age..........I wonder if that could be part of the reason or was it, as these fellows say the fault of Fred Flintstone and his contemporaries. I guess those peddle cars were contributing to ''global warming'' even then, or was it flatulence? Surrounded by hungry predators. Bigger, meaner, better armed, faster reflexes. It was fire that was the 'Great Equalizer'. And as anybody who has actually farmed or ranched discovers to their bitter regret, that a constant series of fires will eventually consume the organic material that turns sand into soil. Thousands of years of deliberate burning together with overgrazing and chopping down all the trees in addition to climate changes? Sur-Prize! Soil turns back into sand. And yeah, I include the Gobi along with the Sahara and the great deserts of the Americas and Australia. "agricultural addiction"?! What kind of moronic characterization is that? If everyone is addicted then no one is addicted. Do you think this article might have an ax to grind? Burning has long been a tool for the farmer or forestry worker and is still a widespread practice today." -You really dont know what youre talking about do you? Did AGW Cult Pathological FAKE "science" create this paper? My aologies TheGhostofOtto1923 for revealing your confusion about this article and about my previous comments. You are equating Modern, Scientifically developed, limited & controlled best practices farming procedures with thousands of generations of activities that were all too often accidental or short-sighted deliberate. If I lack a big gun? And was hungry? I'd start a grass fire to drive some delicious bison off a cliff. If I had a herd of cattle and wanted to increase the grazing range, I'd burn the brush and young trees to create new grassland. If I was homeless and didn't have a sparkling sharp steel axe? Id girdle the bigger trees till they die while breaking up all the branches for fire wood. And for all your smug, self-righteous First Worlder sneer at "primitive savages" from your comfy cocoon of industrial consumerism, that's still the way a good portion of the Human Race continues to scrounge a miserable living, today. No, this time it really was the aliens in your shorts. Circumstantially, it was mostly in the surrounding areas that rjwillis mention. Which were prob'ly at marginally higher elevations at that time cuz of the squeeze that the HEAVY glaciers put on the rest of the planet. The deserts were prob'ly the LOW spots of that larger area that collected all the runoff. The lighter carbonaceous build up being carried even farther to the oceans. THAT was your "flood" of ancient times. Since people didn't travel as much, back then, they prob'ly had no idea where all that water came from (giant melting glaciers). Fires which create carbon to bind to silica most likely occurred. Since it was relatively new, it washed off faster, leaving the silica core which it bound to, much more easily. Volcanoes, meteors, lightning strikes and lastly people, all prob'ly played a part. And lastly, my fun "thought experiment" hypothesis, a LOT of released hydro-carbons from the under the ice (aka methane, an easily ignitable gas), created atmospheric flash fires in various spots around the planet. -and didnt know until I enlightened you. But my earlier comments indicate that forests could have been destroyed and also large animals extincted by repeated artificial wildfires in many regions including central north america and asia. "naturally occurring wildfires play an integral role in nature. They return nutrients to the soil by burning dead or decaying matter. They also act as a disinfectant, removing disease-ridden plants and harmful insects from a forest ecosystem. And by burning through thick canopies and brushy undergrowth, wildfires allow sunlight to reach the forest floor, enabling a new generation of seedlings to grow." Forest life evolved in the context of wildfires. Wildfires are a necessary component of its environment. But when overcover is repeatedly burned, mature forests are lost and cant recover for a long time. "In 1890, however, Bernhard E. Fernow, head of the Division of Forestry in the USDA, visited Nebraska and told the state board of agriculture: "I believe that forest planting is one of the necessary requisites to permanently reclaiming this vast domain; I believe that reforesting this large area, deforested by fire, buffalo, and consequent desiccation is not impossible." -In addition to the environment, recalcitrant farmers and ranchers have made this very difficult. Says the vile Marxist who boasts, in a totally unrelated Astronomy post, that he'd celebrate the current President of the US being beaten to death. Nothing new and lots of clueless comments. We know that humans are responsible for most deserts thanks to the irresponsible use of fertile land and the wanton removal of trees. It happened then and it happens now. Problem is, we now know how to repair the land so it doesn't turn into another huge desert, but man's greed prevents it. Funny they mentioned New Zealand, because there are a few people there (and in Australia) that know how to turn desert into productive land. But it's not only there. There are people all over the planet that know but not enough to make a huge difference fast enough, so we depend on bits and pieces. It's happening all over the planet while people ignore it. It's called greening the world's deserts. Just type "greening deserts" if you don't know what I'm talking about. With a global population < 5M, I highly doubt there was the human density to cause any appreciable impact on any 1 localized area. I'm not sure what the science is behind this article, sounds like pure speculation.